There are cars out there that you completely forget about until you blow by them, parked in a used car lot. After a quick 'aha' moment, they slip back away. Here are the ten cars Jalopnik readers forgot existed. Why We Remember It: Plymouth's entry into the early 1990's tall wagon segment was a renamed Mitsubishi RVR. It was also called the Mitsubishi Expo LRV, Dodge Colt Vista, and the Eagle Summit Wagon. In Europe, it was called the Mitsubishi Space Runner, which has to be up there with the Suzuki Every Joy Pop Turbo as one of our favorite names ever. In some markets the top-of-the-line model got the same drivetrain as the Galant VR-4, but other than that, the car is pretty unremarkable. It would have been so much more memorable if we knew it as the Space Runner. Why We Remember It: The X-Type Sportwagon was the first wagon to go into production at Jaguar. It was otherwise indistinguishable from its sedan counterparts: it could be had with the same selection of six cylinder engines, it was still built on a heavily modified Ford Mondeo chassis, and it was still just a little meh. Why We Remember It: After watching that commercial, I really wish we hadn't forgotten about the XT (also, I'd like some lobstah). Check out that awesome dashboard! Driving the XT must have been just like a video game! And the big red 4WD button on the shifter is the coolest thing this side of James Bond. It had door handles that were hidden by aerodynamic shields, and mud guards that doubled as aerodynamic devices. Its single 22 inch windshield wiper hid itself under the hood, for better airflow. It's a shame the rest of the car was kinda crappy. Why We Remember It: The Talon was another car with a Diamond-Star Motors identity crisis. It was also known as the Eclipse and Laser, but when spotted in the wild it's easy to spot the Eagle. It has a couple of characteristics not shared with its DSM family: the roof was always painted black, regardless of body color, it had its own Eagle-specific wheels, and a big "TALON" across the rear of the car, in between the taillights. Why We Remember It: The Buick Reatta was designed to be a sports car on the outside, but a luxury grand tourer on the inside. This confused many buyers, especially Buick's usual older customers. The touchscreen monitor in the dashboard didn't help, either. Remember, this was 1988, and having a touchscreen that controlled the radio, air conditioning, personal planner, trip computer and overspeed alarm, along with diagnostic functions, was totally unusual. Also unusual was the leather-bound book that came with each car, containing signatures from the special assembly team at the GM plant that assembled the car. That way you knew exactly who to blame when the computer started malfunctioning. Why We Remember It: While we're at it, let's take a moment to remember the Allanté. Cadillac thought it would be a great idea to partner with Pininfarina to design a new world-class luxury car. On paper, it seems like a great idea. In practice, not so much. The Allanté's body was built in Italy by Pininfarina, then shipped 56 at a time in specially-outfitted Boeing 747s to Cadillac's Hamtramck plant. When they got there, they were mated to an underpowered, front-wheel drive car, and became the subject of derision and ridicule amongst the motoring press and public. Why We Remember It: The SC isn't an unattractive car, especially in profile, and was produced for ten years, from 1979 to 1989. Here in America it was sold at Buick dealerships. Unfortunately, only a dozen dealers were interested, and they were mostly around New York City. All told, 488 Bitter SCs were produced in the world, and were powered by either Opel's 3 liter or 3.9 liter inline six engines, making either 177 or 207 horsepower, respectively. Why We Remember It: The first generation Lexus IS was capable, but unremarkable, save for its wagon variant. Lexus went out on a limb in 2000 and made what some would consider a pretty good looking five-door wagon. It's a shame they sold next to none of them, and that the few they did roll off the line and onto the boat for America seem to have disappeared. 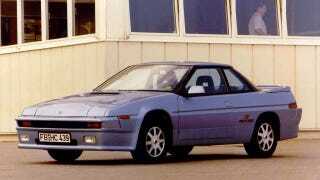 Why We Remember It: From 1992 to 1997, we were treated to the A-Spec version of the MX-6 here in the states. That means, on the highest "LS M-Edition" level of cars we got a three disc in-dash CD changer, gold wheels, embroidered seats, and gold pin striping. Unfortunately, we never got the pleasure of Mazda's four-wheel steering system on this continent. Why We Remember It: The Lincoln Blackwood was a mistake from the minute it rolled out of the factory. Who thought a Ford F-150 with aluminum pinstripes over fake wood around the bed was a good idea? Who thought turning the bed into a carpet-lined, power-tonneau-covered trunk was something the public wanted? Cadillac got it right with their Escalade and Escalade EXT, Lincoln got it fabulously wrong (except in Mexico, where they love the Blackwood). Only 3,356 Blackwoods were made during a 15 month production run. I'd say it's a shame, but it really isn't.